The OH-2C’s effective humidity range is 20%-100%. Take the guesswork out of protecting your instrument. When the relative humidity drops below 40%, a guitar, or any wooden musical instrument, is at risk of cracking or warping. 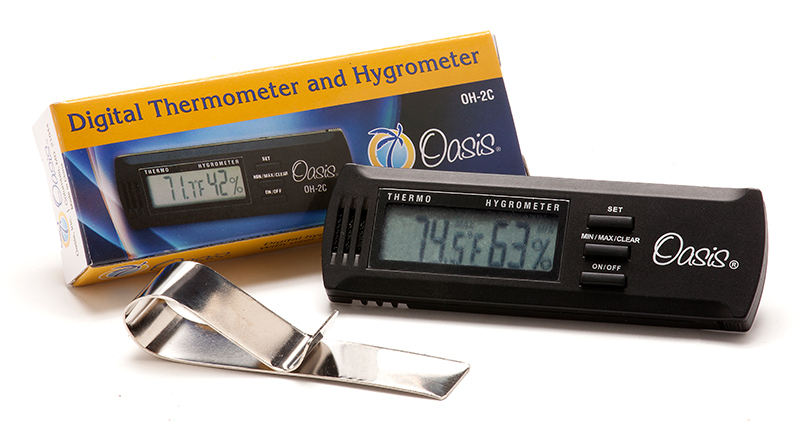 The Oasis® OH-2C Digital Hygrometer accurately measures relative humidity, helping you decide when to protect your instrument with the Oasis® Guitar Humidifier. The OH-2C is identical to the OH-2, except that it allows for humidity calibration. Calibration allows the user to adjust the hygrometer +/- 5 RH points if any changes are needed. 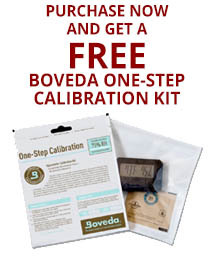 We recommend using the Boveda One-Step calibration kit (75% RH) to determine whether the hygrometer is accurate. Simply open the plastic bag holding the calibration kit and insert the OH-2C. Leave it in the bag overnight and see if the reading on the hygrometer is 75% the next day. In most conditions, the OH-2C will vary less than 3 RH % points. If the reading is not spot on 75%, the hygrometer can be easily adjusted, by following the directions on the enclosed instruction sheet packed in the box.Because relative humidity varies even inside your home, we recommend that you keep your hygrometer near your instrument. For safe placement next to a guitar soundhole, see the Oasis® OH-20 Hygrometer Holder. Oasis® OH-2C Digital Hygrometer Holder $29.95 with FREE shipping. Order now and also get a FREE Boveda One-Step Calibration Kit.